Neat game man. good luck. Thank you. It was also a lot of fun to program. 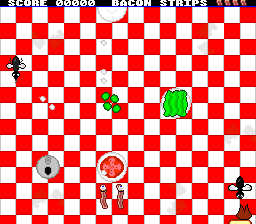 I writing a review of your SNES Homebrew game BLT, and I have some doubts: I played for at least 10 minutes and after some point, the Bacon stopped evolving and nothing else happened in the game, is it like that? Are you writing any other SNES game? The game was written for a Ludum Dare game jam, and as I got closer to the deadline I had to start simplifying things. It will only upgrade to a full sandwich, and then it stops, 10 minutes is about right. I am from The Chicago area in the USA. I would like to develop more SNES stuff, but I’ve been pretty busy lately.